Eshaba is a Khajiit merchant in central Vulkhel Guard. Before completing the related quest, she'll say, "Eshaba has just about anything you could want. So. What can she get you?" After the quest, she's curious if you're looking to buy, saying, "Something catch your eye? Something hard to find? Something exotic?" 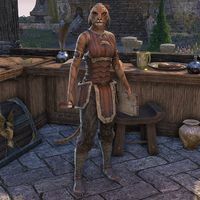 Razum-dar advises you to get a First Auridon Marine uniform from her, she can be found at her store in the forge area. "Eshaba has just about anything you could want. So. What can she get you?" I'm looking for something very specific. "Is that so? Don't be shy. What do you need?" What I need is a souvenir of the First Auridon Marines. "Ahh. Yes. Eshaba has that. The perfect thing to suit your needs! But are you certain? This souvenir comes with certain expectations." Yes, I know what it entails. "A wise purchase, then. Very beneficial. Please take it from the chest, here. Just behind me. If you see our mutual friend again, be sure to give him this one's best." You can then open the chest behind her and take the uniform. This page was last modified on 7 April 2019, at 06:15.